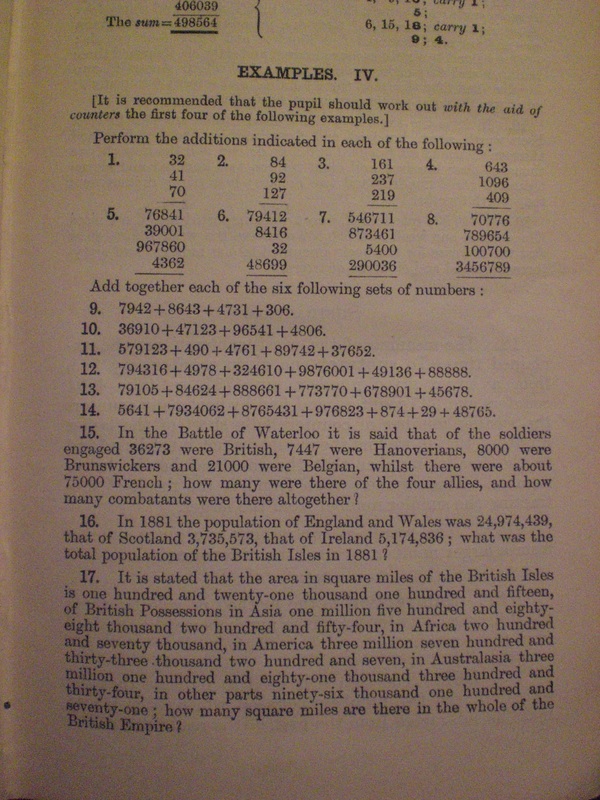 To those who are concerned with current math education, I am eager to share my first in a regular series of posts showing some pages from an excellent English arithmetic book written in the 1880’s. I think my readers will be very interested to compare these with current text books and methods. How do these problems compare with those which might be taught today in India, China, Japan, Korea, Singapore, Hong Kong, Russia, Australia, European countries, or South America? John Bascombe Lock's books are still in print after 120 years. 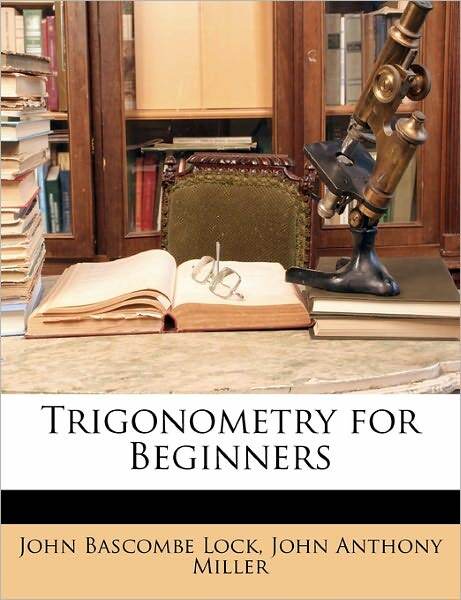 "Trigonometry for Beginners" (for sale at Barnes and Noble online) is just one of his numerous volumes. 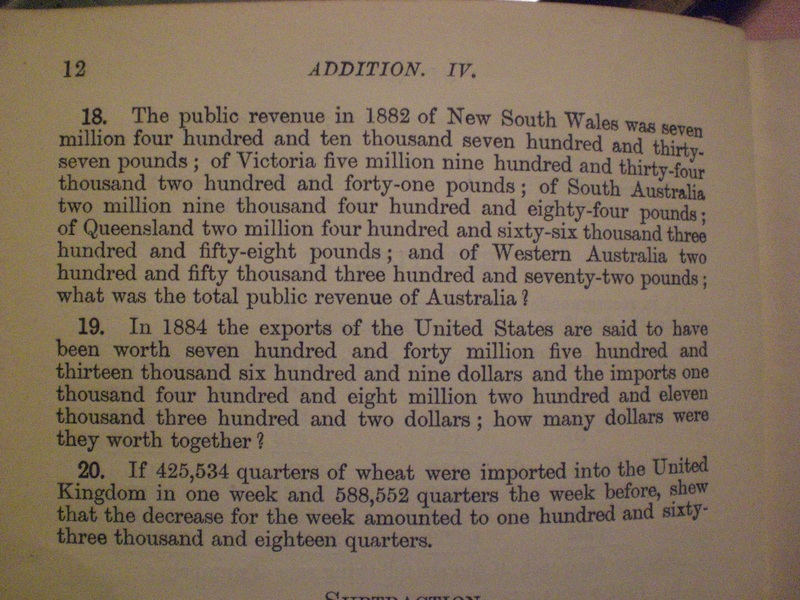 John Bascombe Lock (1849-1921) first published his Arithmetic for Schools in Britain, in 1886. I have an 1897 edition, which boasts of containing a full 8000 problems in its 448 pages (but which in a hardback volume is the typical size and weight of a current paperback book). I got my copy in about 1978, long before I became a teacher, in an antique store located in America. In case any readers are interested, an American edition of Arithmetic for Schools can be downloaded for free from Barnes and Noble HERE. Now with two decades of teaching under my belt, I find this book still helpful to me and fascinating to peruse regularly. While I’ve never been able to precisely determine for which level this book is written, my best guess is that it corresponds with what would today be middle school, or Grades 7-8 (ages 12-14). 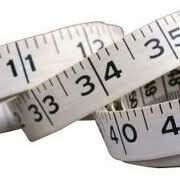 It contains no algebra, only basic arithmetic. Lock served as a master at Eton, then fellow (senior academic lecturer or professor involved in full-time teaching and research) and bursar (official in charge of funds) of Gonville and Caius College, Cambridge. In my How to Teach Cursive Writing series, I discovered I was making the assumption that teachers already know how to write in cursive. Thanks to a reader’s email, I realized that today one cannot make that assumption with teachers under age 35. 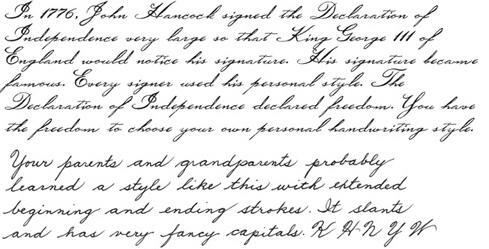 Additonally, there are adults who were briefly exposed to cursive when young, but never mastered it due to insufficient instruction in school. Some of these people really want to learn cursive themselves. 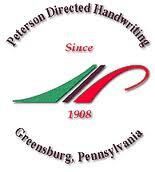 Thanks to Crimson Wife, a professional homeschooling mother of three, posting on cursive writing, I came upon a site she recommends called Peterson Directed Handwriting . If you scroll down to the bottom of the page, you will find four links to four easily-opening online cursive workbooks in Adobe Acrobat. If you need precise instruction in which direction and stroke to move your pen for each letter, start with Cursive Step 1. This looks like a reasonably good place to start if you need this sort of help. What both every teacher and writer of cursive need to know first is where to place the pen or pencil to start each letter, and which direction the strokes go. 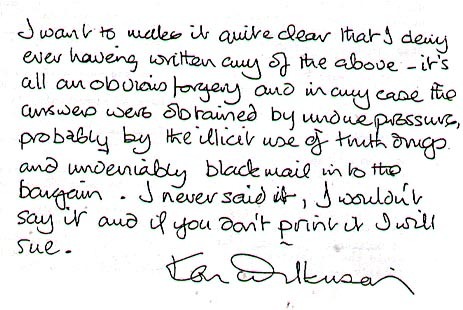 Peterson Directed Handwriting does a good job of this. Once correct letter formation is completely mastered, one can start working on neatness. In the beginning, however, neatness is not important. What is important is mastering correct letter formation, proportion, and slant (more on each of these issues in upcoming posts). My next post will deal with preparing your own practice paper, so anyone needing to learn on their own, as well as teachers who need to prepare their own cursive master worksheets for teaching will find this useful. One of the major problems with the “spiral” math curriculum is that in every grade, limited and precious classroom math time is being wasted on unnecessary math concepts, given the age of the students. Those who have put the spiral curriculum together have moved math education from practical, daily skills to incorporating many advanced and unnecessary skills (for the age of the students). Many of these topics could be saved for higher grades (6-8) and students would arrive better prepared, and intellectually ready. Some important topics, which are covered briefly in the curriculum, but to which little or no time is devoted to practice or mastery of these important life skills: making change for customers, knowing addition and multiplication tables by heart, knowing how to do the simplest operations without a calculator, being able to recognize a wrong answer when a wrong button has been pushed on a calculator, developing estimation skills, becoming competent in measurement and fractions (useful to every housewife in halving or doubling recipes on a daily basis). Consider: Are we not cooking anymore in American society? Are we not hanging picture frames? Are we not doing any home repairs or improvements ourselves? Is there never a need to count back change? 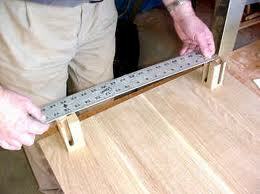 Does no one sew or do woodworking for pleasure anymore? There is also a great disconnect in many classrooms between the material students are working on, and on knowing the reason for learning it. Instead of letting students feel that they are learning skills which can be useful to them NOW, so much time is wasted on learning concepts where the only use is for passing a test which seems useless to the child. 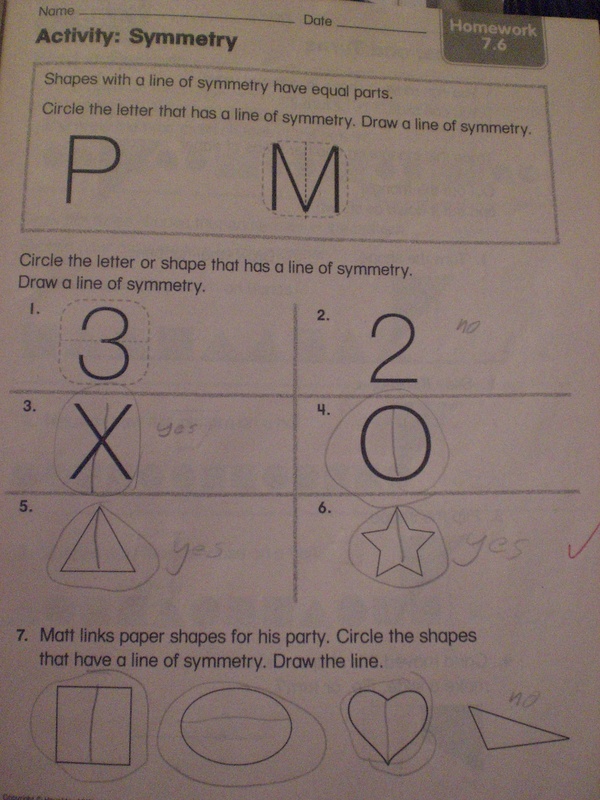 Younger elementary children are mostly concrete learners, and they love and appreciate fun concrete tasks to work on. 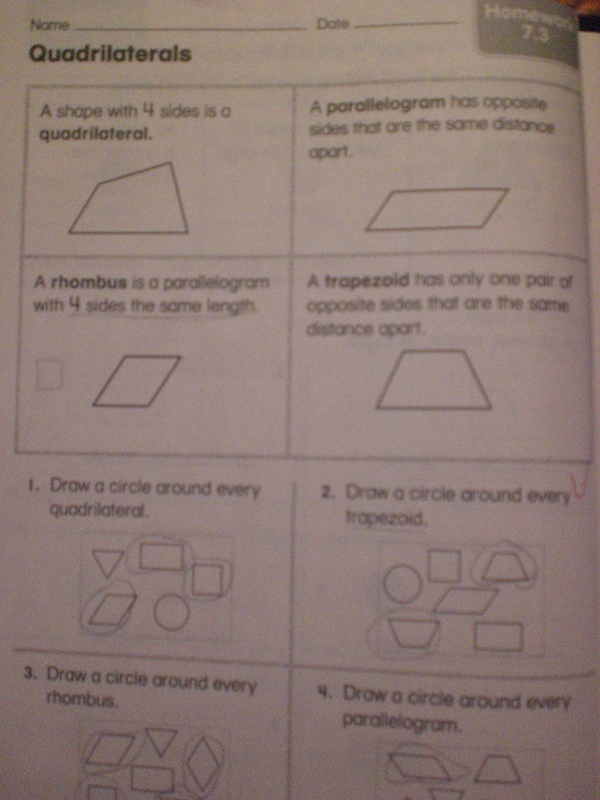 Grade 2 spending time learning to differentiate between types of quadrilaterals. Grade 2 spends time working on composition of shapes viewed in 3D. 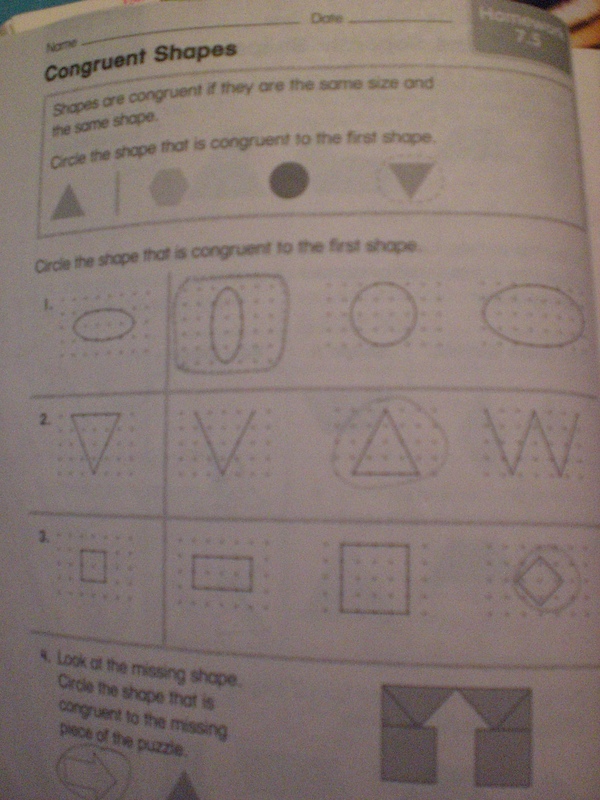 Grade 2 spends time learning about congruent shapes. Grade 2 spends time on learning about lines of symmetry. Grade 2 learns about slides, flips, and turns of geometrical figures. 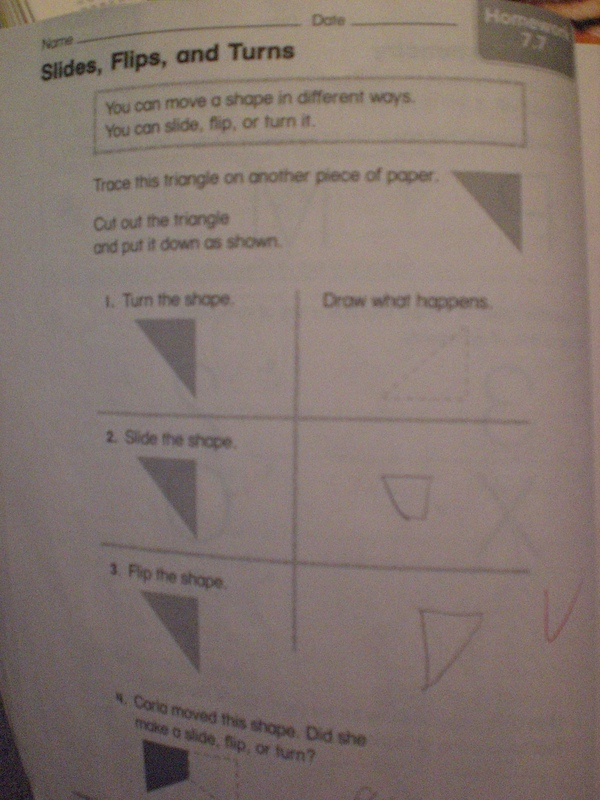 Are the Chinese or Indian students spending time on these things at age 7? I doubt it. 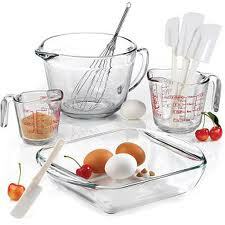 In my opinion, more time needs to be spent on mastery of basic life skills in the early elementary grades. One last point about the spiral curriculum. Math educator Brian Rude feels that the spiral curriculum should not be thrown out entirely, but that the problems are caused from barely touching on subjects each time, instead of cutting a bit deeper, so that information is retained. He points out, however, that if cuts are too deep, that there is a danger of never having time to return to that subject, and students will also forget. He feels a balance between the two extremes is best. I’d estimate that at least 30 hours of drill, spread over a period of time would be required for an average child to learn addition facts, and an equal amount of time later on to learn multiplication facts. 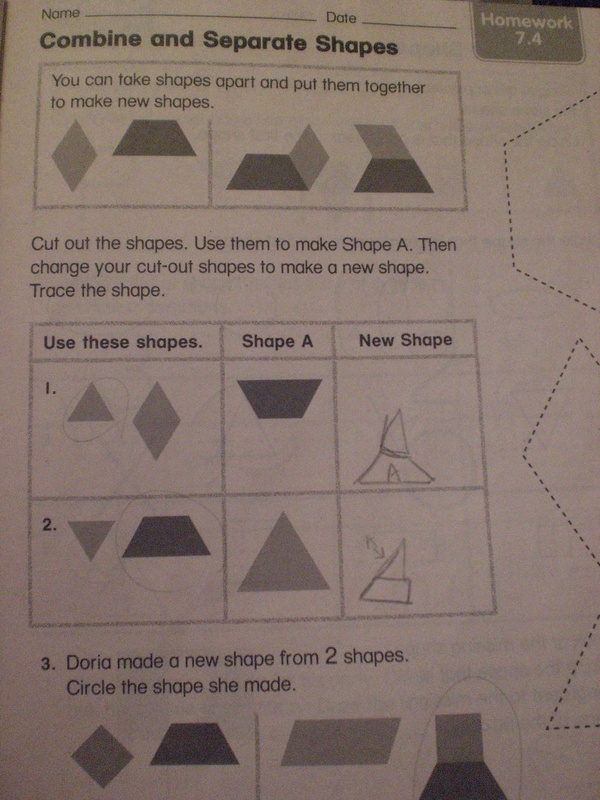 But there is NO classroom time provided for this in the math curriculum. The problem here, speaking as a third-grade teacher of 8-and-9-year-old students for a decade, is that the elementary math curriculum (in America) is not structured to provide ANY time for drill such as he describes. Even when I was a child in the early 1960’s, we did not have drill of that type in elementary school. My mother worked on flash cards with me 10-15 minutes every day before I was allowed to play. I HATED every moment of it, but saw the value of it when I got into the working world in my 20’s and was using multiplication every day, knowing my multiplication tables by heart thanks to her efforts. I’ve been discussing math teaching with other math teachers for several years now, and I find there are several trends I highly disagree with. Trend 1: The amount of math homework has been cut in half from 24-30 problems nightly, to 12-15. I can only guess that this has come about from parents complaining about too much homework over the years. While I am in favor of not giving more homework than necessary, unfortunately, the current lighter homework often does not give sufficient practice in a certain type of problem for the students to be able to understand or master that type of problem. One or two examples of a certain type of problem are just not sufficient. Trend 2: Drill practice is considered “old-fashioned.” Never mind that the teacher can make drill practice into a fun lesson, just like any other type of lesson can be made fun by a a dedicated teacher. 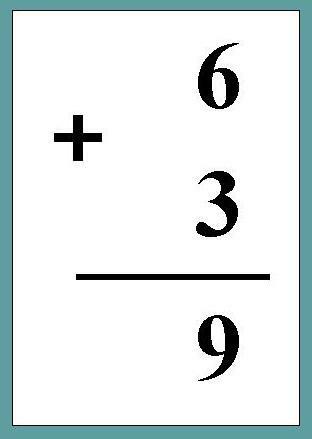 Without any drill, and without parents practicing or drilling children at home (such as the type of flash card practice my mother did with me as a child), many children are just NEVER mastering even the basic addition facts, let alone multiplication facts. I no longer teach Grade 3; I am now a private tutor. 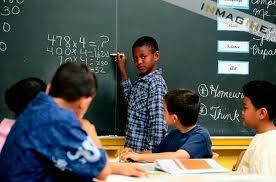 Unfortunately, I am now running across a number of 14-year-olds who are using calculators to add 5 + 3, or 7 + 6, or 9 + 2. What’s even worse, THEIR TEACHERS LET THEM!!!! I personally think calculators should just be thrown out until about Grade 11, or whenever math involving higher functions on calculators is started. Prior to that time, they shouldn’t be allowed in school at all. 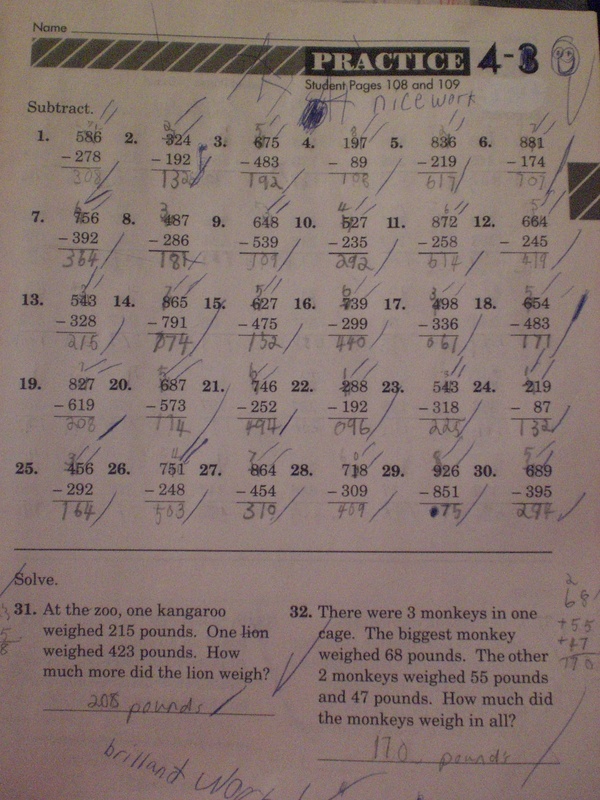 When I taught Grade 3, I made students show all of their work on their homework, including every carry number, and every cross-out for borrowing; I didn’t allow them to say, “I did it in my head.” (See photo above of example homework prior to 2007.) 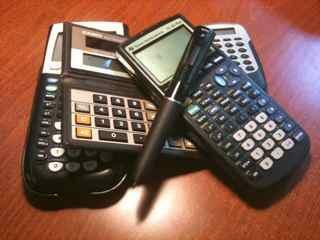 One reason for making students show all of their work (I had several reasons) is that I knew perfectly well many of them had calculators at home. However, even if they did their homework with calculators, they would have to redo it to mark all the carry numbers and borrowing cross-outs. This makes it better to just do it by hand in the first place. 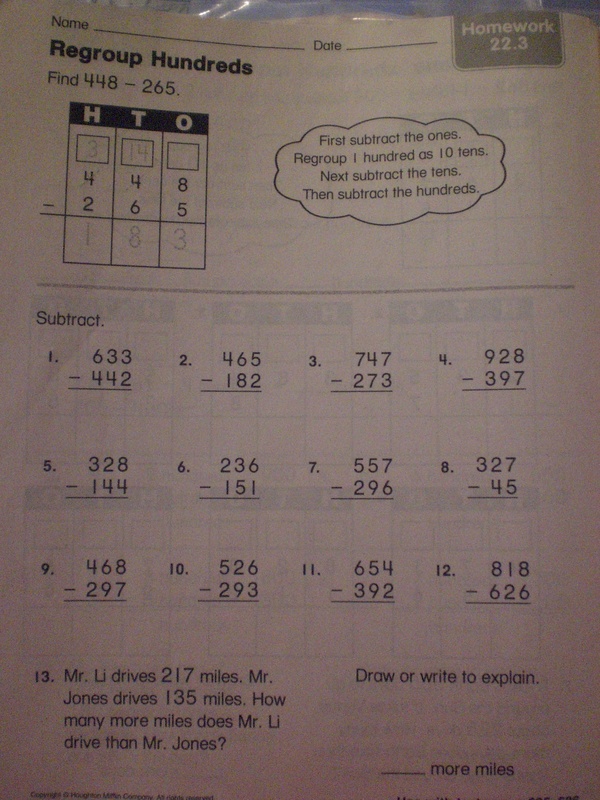 I then spent 30 minutes of my teaching time DAILY, going over these homework problems. It’s so satisfying to a teacher to hear, “Oh! Now I see my mistake!” It’s a big mistake for a teacher just to mark answers right or wrong, as students learn nothing from that. Trend 3 (mostly at the high school level, I haven’t yet seen it appearing in middle schools, although I could be mistaken): Don’t instruct and explain, and then follow up with practice to master the skills. Instead, put students into groups, and let them see if they can “figure out themselves” how to do problems. Don’t give much feedback, but of course, students will have the same test as if you taught them the traditional way. (So the parents who can afford it get math tutors to do at home the job that the teacher should be doing; the parents who cannot afford tutors or understand the math themselves have children who completely fail math). 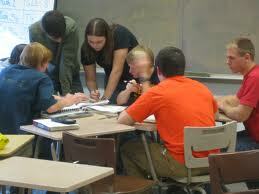 High school math class, with students working in groups. Even though I’ve never seen it, in the past couple of years I’ve become aware that “Singapore math” requires mastery of each math subject to a certain degree before moving on to the next math subject. I think students would be far better served by having HALF the number of math topics (eliminating topics in Grade 2 such as Data, Graphing and Probablility; Congruent Shapes and Symmetry; etc.) and making sure they have mastered basic addition facts (by heart), addition and subtraction of two-digit numbers, and multiplication tables up to 5 (by heart) before moving into Grade 3. If parents don’t have time to drill children at home on these facts, then some time for it should be allowed in the school curriculum. 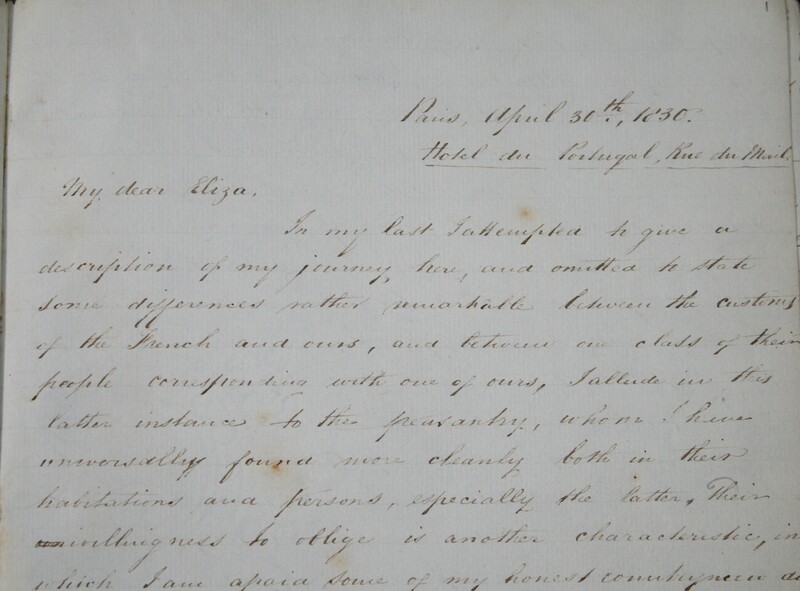 Examining older samples of British writing (1800s, and much of the pre-WWII writing), the British handwriting of that time was slanted to the right (as were cursive scripts in most European countries). Now, most British writing is vertical. How and when did this change come about? 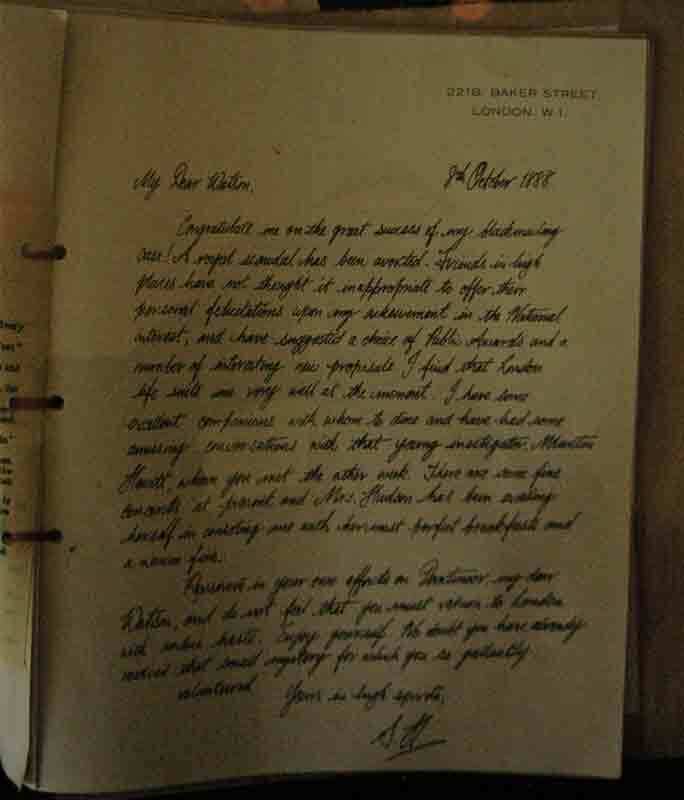 Reading this 1925 letter written by A. N. Palmer, developer of the Palmer Method of handwriting, the actual preferred slant used to be a very precise 52°. Mention of the precise 52° angle is also made in this 1893 article (see p. 87 at this link) which argues for an introduction of vertical, unslanted writing. Today, an ideal slant is considered to be between 60° and 75°. In Britain, in the early 1890’s, Professor John Jackson introduced vertical writing, which he felt had superior legibility, and was easier for students to learn. Examiners began to require it in all branches of the Civil Service. 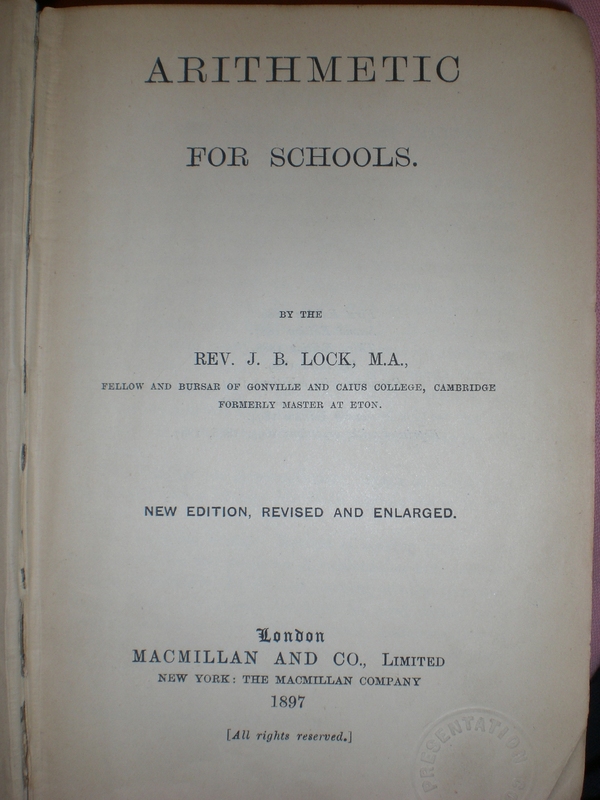 Many English schools began to adopt professor Jackson’s copy books. Progressive German schools also began to use Professor Jackson’s system. As a teacher of handwriting for many years, I disagree, however. Trying this out personally, I find that in vertical writing, the position of the hand creates a far greater drag on the paper, because of the hand being in the way; in forward-slanted writing, because the paper is turned, the position of the hand creates much less drag and the hand can move across the paper more swiftly. Again, as a teacher of slanted cursive for many years, I can firmly state that if students are twisting in order to write slanted cursive, it is because the teacher does not know what they are doing in terms of showing students that they should be turning their paper on a greater angle in order to achieve the desired slant, rather than twisting their body. Yet, in America, according to Palmer, “The vertical fell of its own weight…because in slowing down the process of writing, it was even worse than the old 52° copy book style.” The Palmer method was developed specifically for business use, meaning for speed combined with legibility. 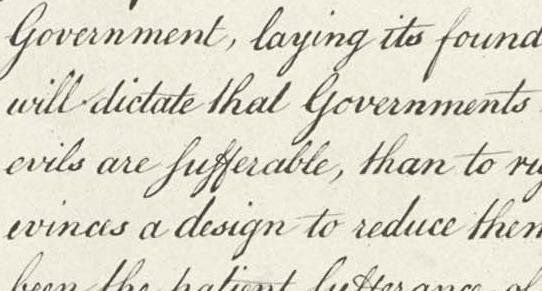 American cursive remains slanted to this day. Teaching Cursive: Part 1 (of 25) –What NOT to Do! Knowledge of how to teach cursive writing is becoming lost at an even faster rate than is cursive itself in the English-speaking world. Interestingly, this is not the case in many non-English-speaking European countries and their former colonies around-the-world, in which printing is not ever taught. 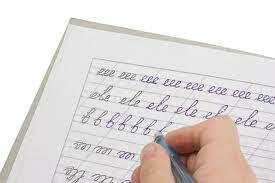 Instead, five-year-olds begin immediately with learning cursive letters. 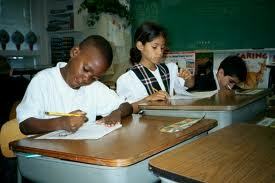 This post will not deal with the issue of whether cursive should continue to be taught. 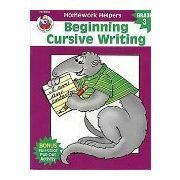 Instead, it will explain the proper procedure for teaching cursive, since there are few teachers left who really know how. 1. Give the students a workbook and tell them to work through it on their own whenever they have free time. This method is the fall-back approach for a teacher who is asked/told to teach cursive, but who doesn’t have time/isn’t interested/doesn’t know how/doesn’t know how to write well (or at all) in cursive himself or herself. 2. Put a letter (and later a word) on the board, and tell students in the class to “copy” it, leaving each child to devise their own different method to attempt a facsimile. Unfortunately, this is the method most often employed in some former French colonies (and many other places), with abysmal results. 3. Tell students to keep their papers or cursive workbooks straight in front of them while writing. This produces an incorrect vertical script, or even a backslanted script, angling upward to the left. The paper or workbook must be turned in order to achieve an acceptable slant, and this habit needs to be demonbstrated and enforced in Kindergarten when children first are learning to print. Student correctly slanting his workbook to write. Cursive script in languages which are written from left-to-right should be be slanted upward to the right (English, French, Italian, Spanish, or any languages written using a Roman script). Cursive script in languages which are written from right-to-left should be slanted upward slightly to the left (Arabic, and other languages which are written using the Arabic script). This series of articles, however, will deal with teaching cursive writing in the American script (but the methods are the same for teaching any Roman-letter cursive script). In some countries, vertical scripts are acceptable, but slanted scripts are much more beautiful and generally more highly esteemed. 4. Treat cursive as a subject less important, or less interesting, than math, science, or reading. To achieve a good result, cursive needs to be given an equal (or greater) priority to all these subjects for a short period of time (the 6-8 weeks it takes for the whole class to learn it well). Teachers can make cursive a very fun class that everyone will look forward to, and techniques for doing so will be described in this series. 5.) Start by teaching only the lower-case letters, and save the upper-case letters for “later.” This generally results in non-mastery of cursive, because the students never learn, nor master, all of the capital letters. Instead of writing some letters in cursive, and others in printing, students revert back to printing because of not feeling competent in writing cursive captials. 6. Grade the students on the neatness of their writing. This is a BIG mistake. Cursive writing is not about neatness. It is about speed and usefulness, first of all. Secondly, it is about being clear enough to be understood; for most people, it need not be a work of art to achieve these objectives. For those who enjoy it, beauty can be achieved in addition (but this should have nothing to do with grading). Students should have their cursive writing graded on three OBJECTIVE criteria ONLY: 1.) Are the letters being formed correctly, starting in the right place, looping in the correct direction, retraced correctly, and crossed or dotted correctly? 2.) Are the upper zones and lower zones in balanced proportion to each other? 3.) Is the slant consistent, and within an acceptable range? And yes, left-handers can achieve the correct slant (techniques for left-handers will be discussed in this series). With these guidelines, most students are quite capable of achieving grades which will motivate them. Keep in mind, the writing of some students can meet all three criteria, yet look messy. If the criteria are met, the student should have an A (grades in the American system fall between high grades of A, and low grades of F.). This is especially motivating to some young boys who have more difficulty than many girls in achieving neatness. These A students with messy cursive are often the students who later become most motivated of all to improve the neatness of their writing, seeing their success on objective criteria. 7. Have children copy long passages nightly, claiming it is “to improve their handwriting.” Copying on one’s own, without specific feedback and instruction from the teacher, will NEVER improve students’ cursive writing and is guaranteed to make children HATE cursive writing forever, rather than it becoming a useful and enjoyable life skill. Correct techniques for improving neatness in cursive will be discussed in this series.